This week might be the craziest one of my mission so far. Hope you got all the pictures. They loaded on the computer, but I couldn’t see them on the email. Hopefully I will explain most of them. The park we went to a couple weeks ago, we played volleyball and then went on a hike up the large hill there. It was a pretty cool view of the downtown L.A. There was a baby bird on the side walk so I used a Word of Wisdom pamphlet and put it in the grass. Per white bible page 45 we can’t have pets :(. 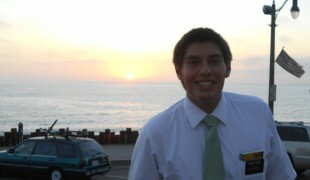 One of the pictures is of Elder Mendaza. He is a Zone Leader and we were on splits. He’s from Auckland New Zealand and really cool. I tried to include some pics of our apartment. It’s ok but really small. You may see the dent in our car. The bike rack is also supposed to be upright. I don’t know when they will fix it. Dented trunk – Don’t text and drive! I got your package on Friday! Thank you so much! We are allowed to open our mail on Fridays also! This week we had one of our investigators (the athiest-surfer girl) come to the Visitor’s Center with a friend. It was really great and I hope they felt the spirit. She leaves tomorrow for college in New York. Some liberal arts school. She did promise us to continue taking lessons from the missionaries! Any suggestions on how to help an athiest believe in God … ? The craziest thing this week happened on Friday. 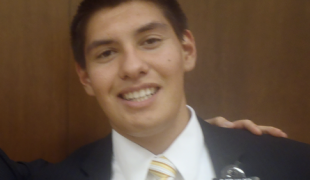 Elder Campbell my companion has been having troubles with his diabetes, high sugar levels then dropping really low … , and he was training and being a District Leader. So Friday morning he talked with President Weidman and they decided it would be best for him to go home to recover. We took him down to the mission home that afternoon and his flight was for 9am Saturday. I hope he gets better, but he wouldn’t tell if he was coming back out or not. I think it would be tough to come back out. Well since he left, I inherited most of his stuff. Weights, scripture marking supplies, shoe polish, ties and two BIKES! So the bike problem is fixed. I have a lock, helmet, and lights for them also. In one of the last pics you’ll see a set of elders with us. They are Elder Street and Fertig. From Utah and Colorado respectively. I have had to move to their apartment also. It has been a hassle. They lived in a dirty apartment so I convinced them to clean it. We spent 3 hours. You should see a pic of the kitchen floor. Pretty nasty. It has been fun in a trio unless your in a lesson. Imagine three guys trying to talk to you about the gospel at once. I’m so glad you are taking care of the elders out there. We are being taken care of really well! Next I want to talk to you about “U-Night” Our ZL received a missionary book from his mom. In it, it had a story. The setting is in Maine around the 1960’s. There was a branch president who turned his branch into a stake five years later! The first year they baptized like 400 people, then 100 the next year. The reason for this success is that he called 3 proselyting families. They were each required to bring a family the next week to a U-Night. The bishop then showed a video and bore his testimony. Missionaries and member would then teach lessons along with this every week until they were baptized or stopped coming. After each family was baptized they would bring a family along with the original family. This was super successful and we felt like we were supposed to do this. We presented it to our bishop at PEC and got our domes smashed! He wanted a plan to be the ward’s plan and not the missionaries. Other members of ward council weren’t too on to it. I think they are scared. Our WML loved it though. We will still try to do something similar. Other wards have accepted it though in our district! A similar plan has been approved by the stake, but it deals with more of a individual basis. I wasn’t able to explain very well but I will try to get you the book title. I am rejoicing that it seems dad had a similar idea on his own! I think it is the way to do missionary work. Sorry I’m rushing. Thank you so much!